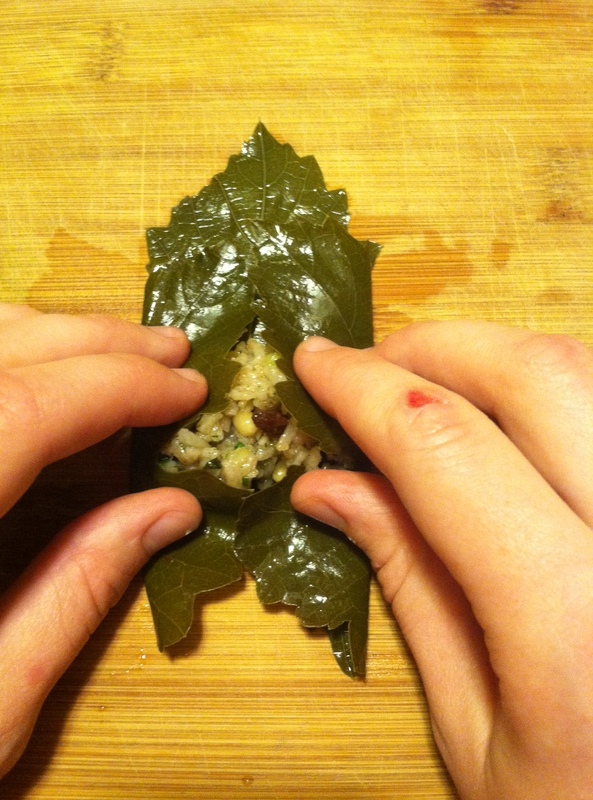 Dolmas aren’t as difficult to make as you think! This recipe is another part of my Mediterranean series. I’ve also done a Mexican series and a burger bar. So far for the Mediterranean series, I’ve done pita bread, tsatsiki and hummus. 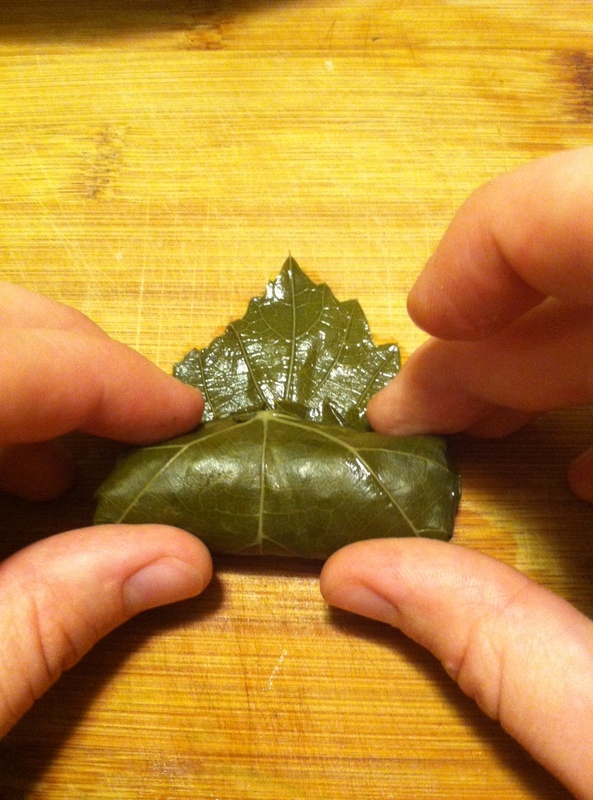 So here’s how to make homemade dolmas. 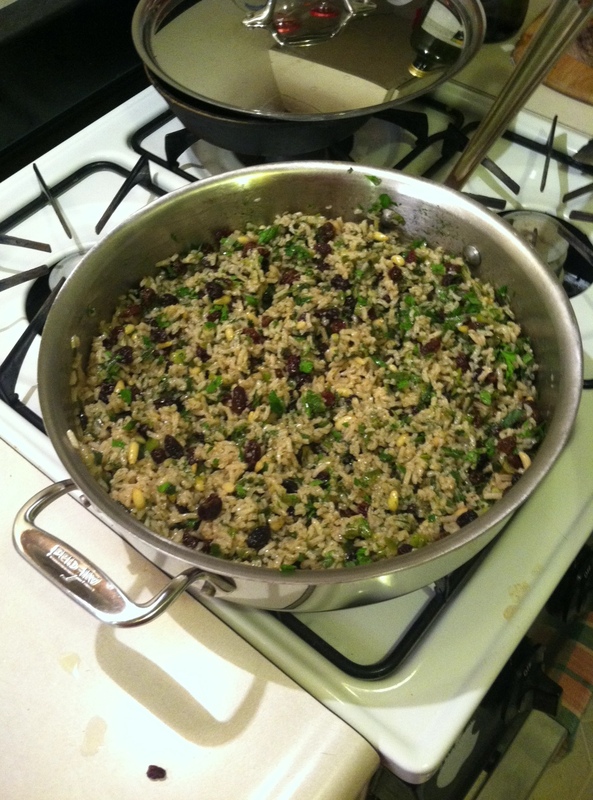 I make my filling with rice, pine nuts, raisins and herbs. Next time I make them I will probably try a meat and rice filling, but this filling is delicious. 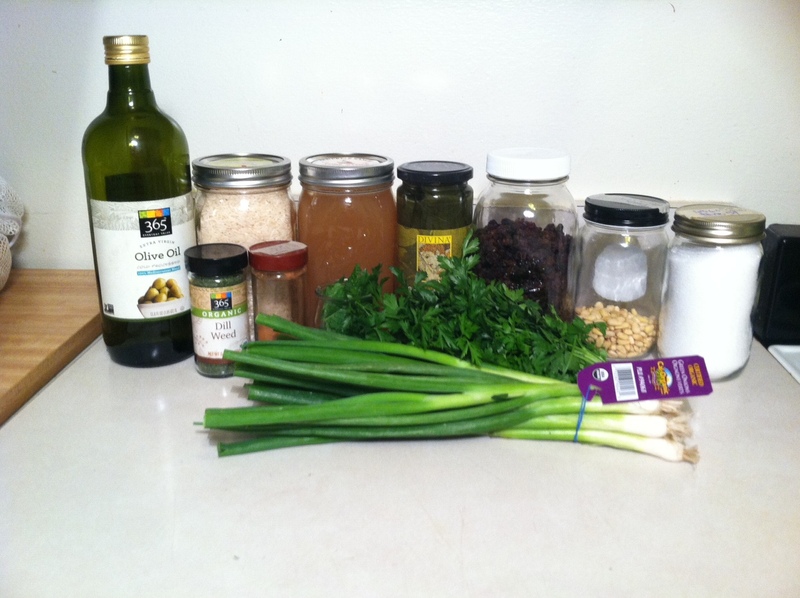 Use homemade vegetable stock instead of pork stock for a vegetarian/vegan option. These are gluten-free as well. 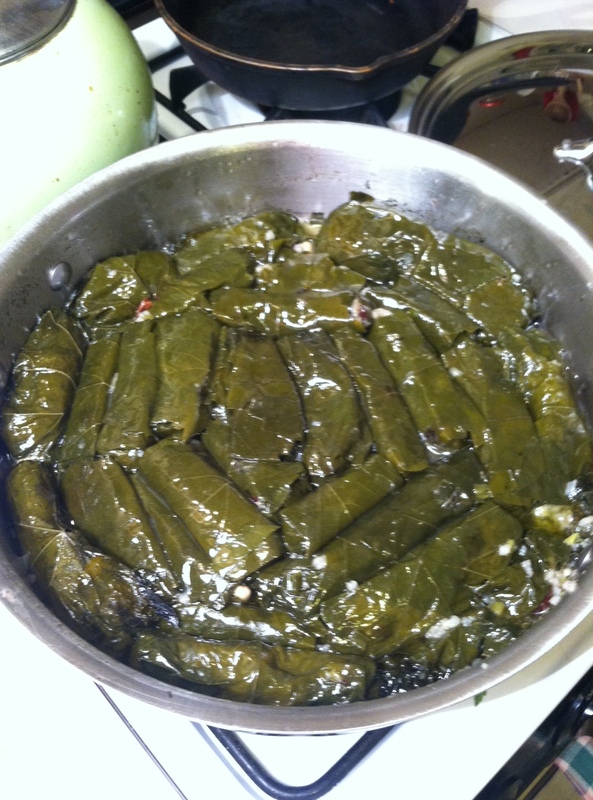 Drain the grape leaves and put them in a bowl. Cover with boiling water and soak while you make the filling. 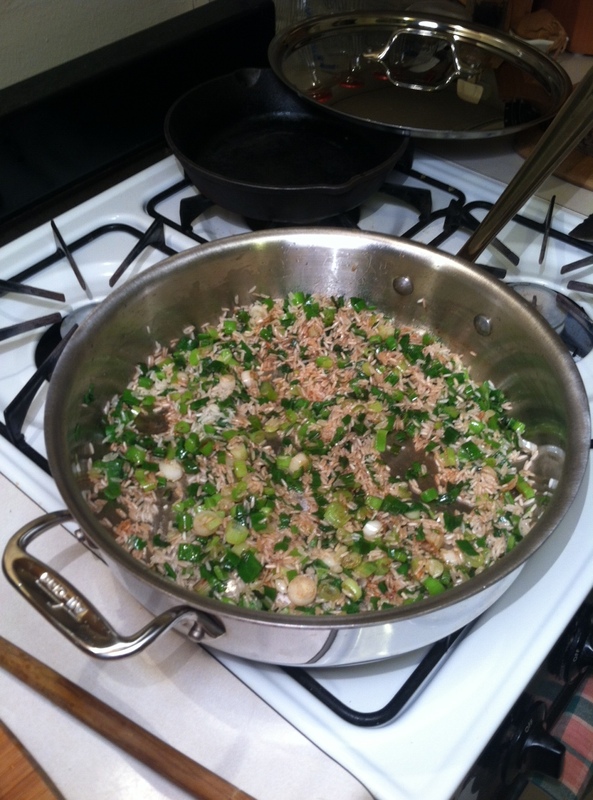 Heat the 3 tablespoons of oil in a skillet. 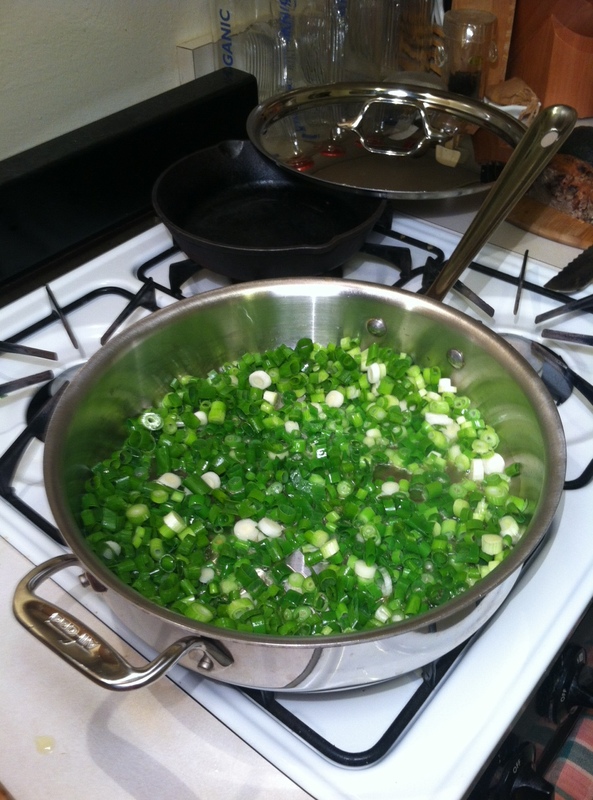 Add the scallions and cook until softened, 3 to 5 minutes. Add rice, cinnamon and salt to the pan and stir until combined. 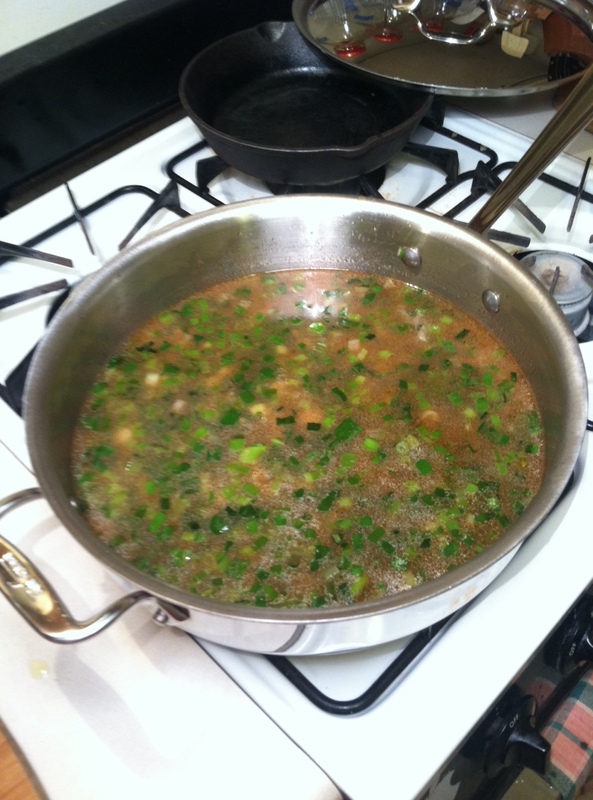 Add the broth, bring to a boil and simmer, covered, for 10 to 15 minutes or until liquid is absorbed. 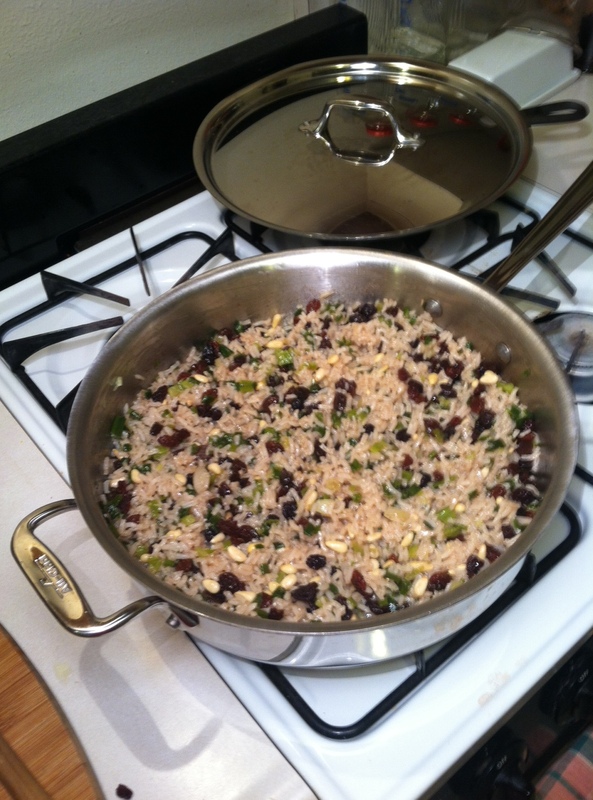 Remove from heat and stir in pine nuts and raisins. Let stand, covered, for 20 minutes. This way the raisins will plump up. Stir in parsley, dill and mint. Now you’re ready to start rolling! 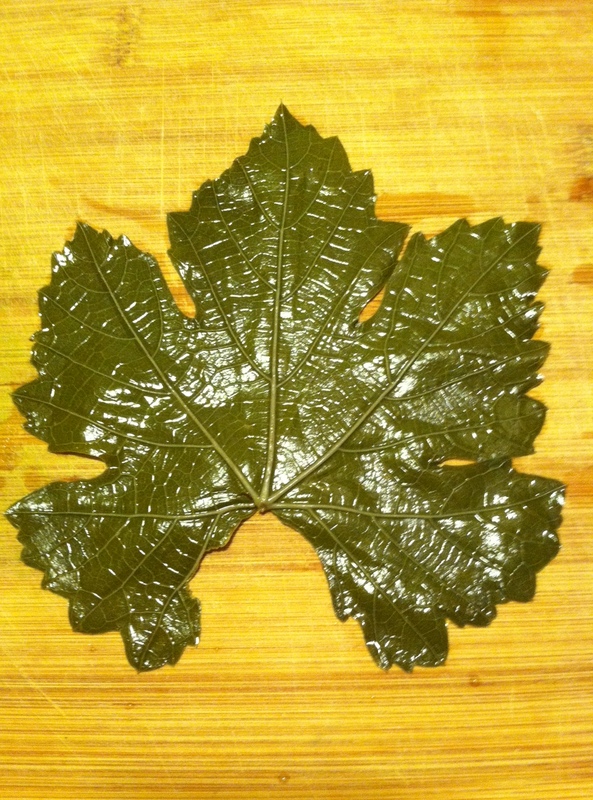 Line the bottom of a skillet (like the one above) with grape leaves. 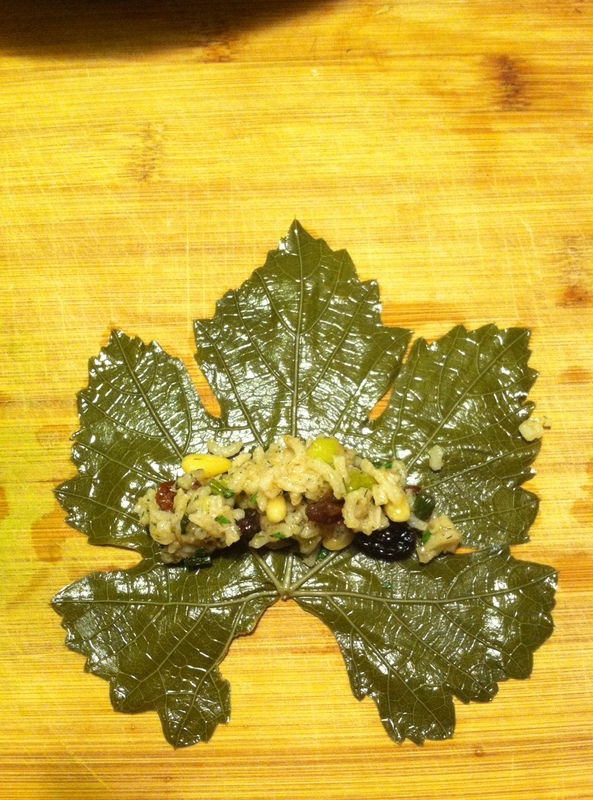 Take a grape leaf and place it shiny side down with the stalk facing you. 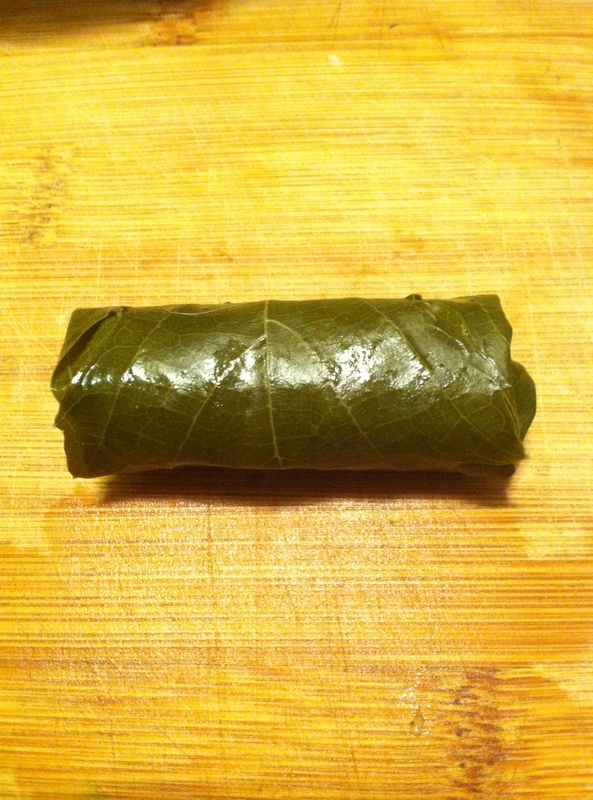 If you’ve never rolled dolmas, start out with a nice looking leaf. The misshapen ones are more difficult to roll. Add a bit of filling just above where the stalk ends. How much you add will depend on the size of the grape leaf. For this one I used about a tablespoon. Now comes the tricky part. Fold in both sides of the leaf. Start rolling it up from the stalk end. 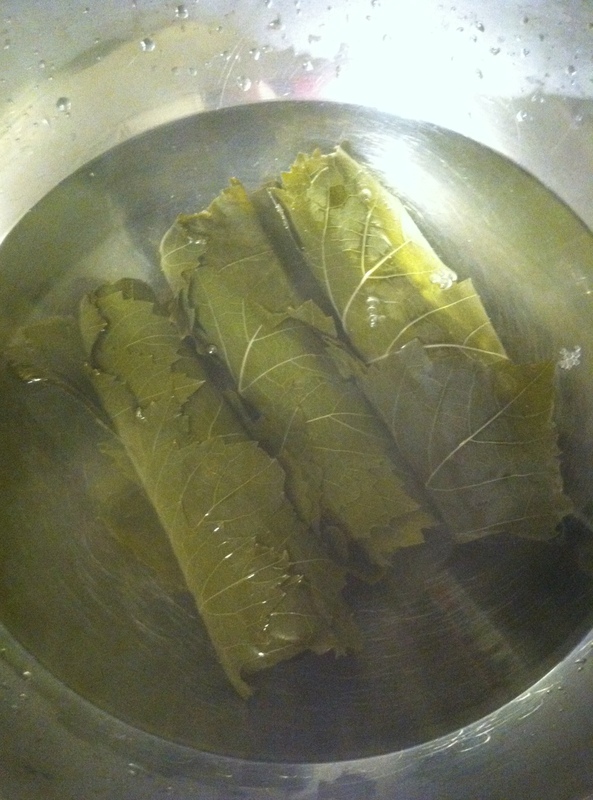 Place each dolma seam side down in the pan. 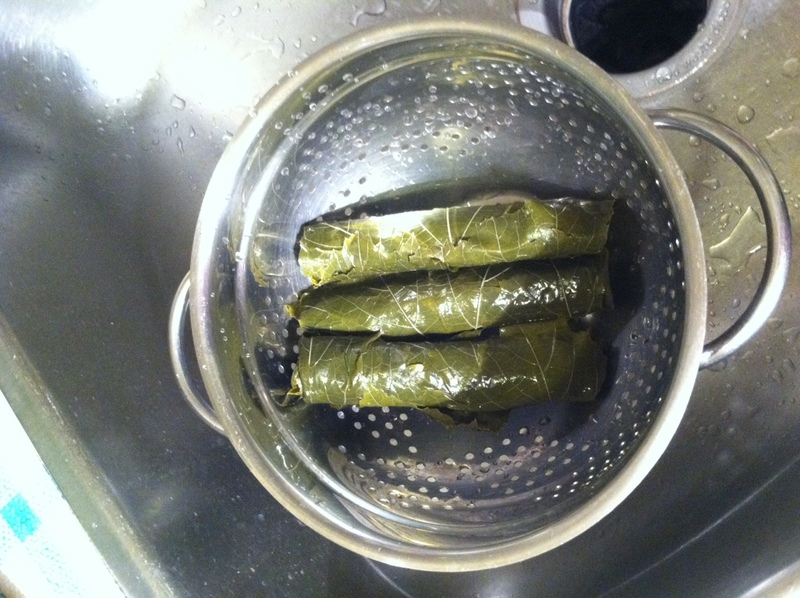 You can make multiple layers of dolmas, but they have to be tightly packed. So make sure that you have enough leaves and filling left to make a second layer if you start making one. 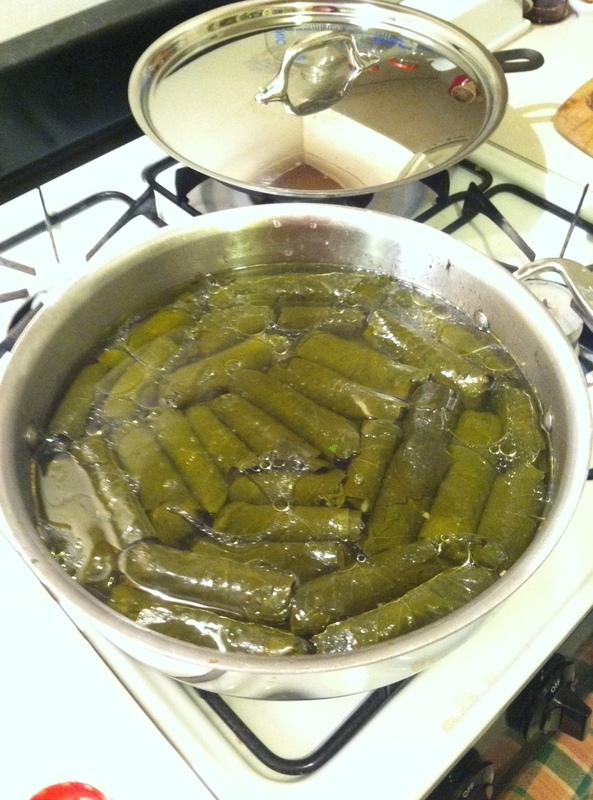 Pour the half cup of olive oil over the dolmas. Add just enough water to cover. Weight the dolmas down with a plate. 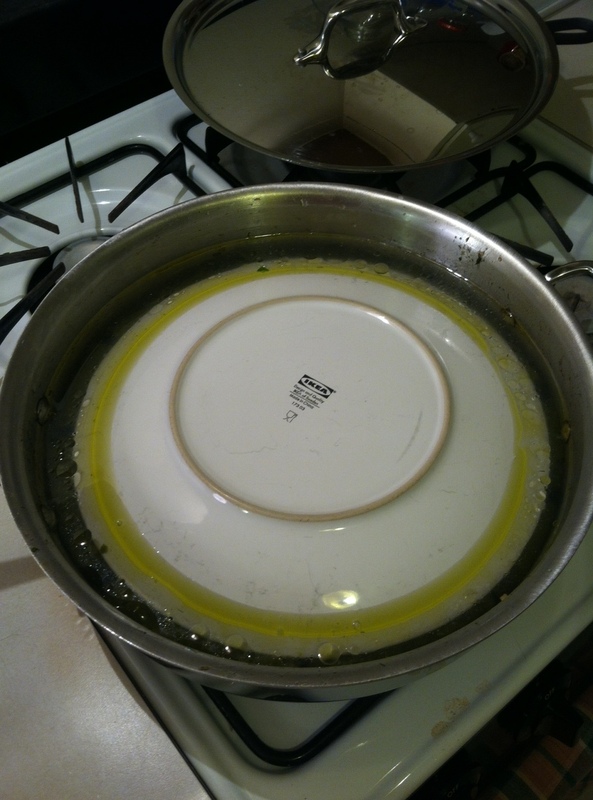 Put the lid on the pan and simmer for an hour. 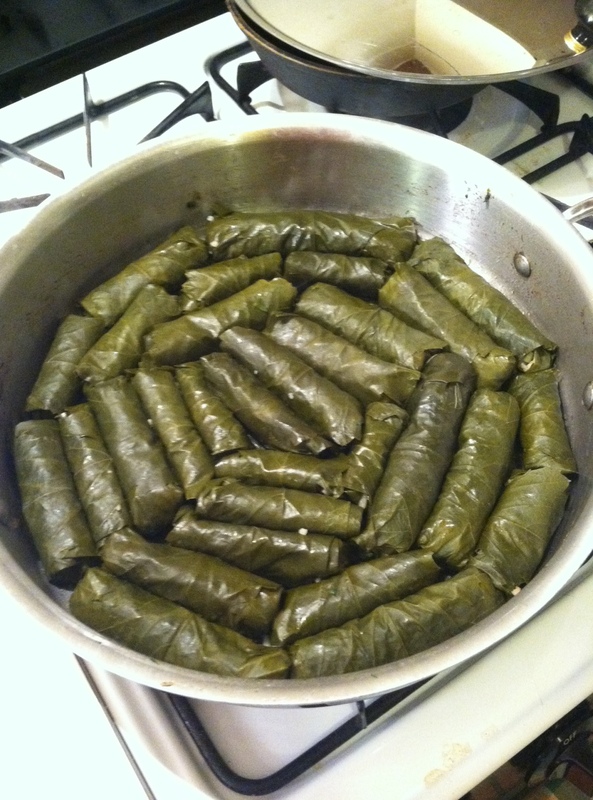 When the dolmas are done, they might look a little squished, and some may have exploded. Don’t worry! They still taste good and most of them will be fine. Serve with pita bread, hummus, tsatsiki, baba ghanouj and falafel for an awesome Mediterranean meal. The recipes I haven’t linked to are coming soon!